The Great Flood in the Bible was the most devastating flood, washing out the entire existing population of the Earth after 40 days and nights of continuous rain. Only Noah, his family of eight and an assortment of few thousands of animals and birds were saved in an ark. This is a picture of God’s saving grace when He vowed that He would never again destroy the earth with such a flood again. Let us have look on to the floods that have hit the World very badly. Floods have occurred again and again since then. Floods indicate an overflowing of a large amount of water beyond its normal confines onto normally dry land. This can be for two main reasons- increased rainfall or faster melting of ice. The ancient Egyptian civilization welcomed the floods of the Nile River because it brought rich and fertile soil to its valleys. There is immense power in moving water. The energy of the moving water is proportional on the square of its speed. That is why even standing in six inches of fast moving water can knock you off your feet. During floods car, buses and even trucks are flung about in its force. The damage potential of a flood is magnified by the debris it carries i.e. trees, boulders, vehicles, buildings etc. Water alone without moving something can damage or destroy objects such as books, furniture photographs and electric equipment. It is a good conductor of electricity, and so there is the danger of fatalities when broken live wires lie in water. Flood waters contain microorganisms and dissolved chemicals. The drinking water supplies are usually compromised during and after a flood. And it takes a while to restore this. There can be widespread disease in the community. The debris left behind by the flood is another health hazard and has to be cleared off. Sometimes bodies of dead and decomposing domestic or wild animals are trapped in it. In addition to this animals that have escaped from their homes due to the floods are driven to enter human habitation. This creates problems if they are aggressive or venomous. Hwang He River (1887, 1931, 1938), ChinaThe Huang He or Yellow River is about 3000 miles long and is the second longest river in China. The Chinese Civilization was birthed on the banks of this river 5000 years ago. It floods nearly every year. The banks of this river are low. During the flood season the river overflows depositing yellow coloured silt over the floodplains. All homes built along its banks are destroyed. Dykes were built along the river to control its flooding. On 28th september1887 a particularly devastating flood occurred. It had rained for several days and the swelling river overcame the dikes built along the river in Huayuankou near Zhengzhou in the Henan province. The flood affected 50000 sq. miles of agricultural settlements and commercial centres. Many died during the flood and the resulting pandemic due to lack of basic essentials killed almost an equal number of people after the floods subsided. The death toll was nearly two million people. A more destructive flood occurred in August 1931 About 34000 sq. miles of land was affected completely. 8000 sq miles was partially flooded. It is estimated nearly 850000 – 4000000 people died in the flood and the following disease and famine. 80 million people were left homeless. This time the floods occurred in the Hwang He, Huai and Yangtze Rivers together. There had been a severe drought from 1929. In the winter of 1930 there was heavy snow fall over many parts of the country. In the spring and summer of 1931 there was thawing of the snow accompanied by heavy rainfall in July 1931. The rivers were higher than normal levels. At this period 9 cyclones hit China. The area recorded 24 inches of rainfall along the banks of the Yangtze River. The Yellow river burst too. Since much of trade occurred via this river China was affected socially and economically. There were huge losses to the farming industry. Nanjing was the capital of China at the time and was built on an island. The waters of the overflowing Huai River entered the city and caused colossal damage. Millions drowned and the many were affected by cholera and typhus. The third major flood recorded at the Yellow river was in 1938. This was not a natural disaster, but a planned act of environmental warfare. The Sino- Japanese war of 1937-45 was underway and the Japanese troops were advancing. The Chinese nationalist forces under orders from Chiang Kai-Shek destroyed the dykes near Kaifeng in Henan province. The Henan, Anhui and Jiangsu provinces were flooded. Many dies and many were made refugees. Thousands of sq. miles of Farmlands were were destroyed. The mouth of the Yellow river was shifted to the south. For many years these lands were abandoned. The land was uncultivable for many years because of the silt and the loss of the irrigation canals. The dikes were later rebuilt in 1946-47. The exact number of people affected was not accurately recorded, but current estimates put it at 5 million people affected. Floods as we have seen are not always occurring naturally. At many places dams have been constructed blocking the free flow of rivers.at times these dams can fail structurally. When this happens there is a dangerous sudden release of stored water at great force. The Banqiao Dam was built across the river Ru in Henan province, China in 1952. It was called an “iron dam” and considered unbreakable. During the typhoon Nina of August 1975, more than 31.5 inches of rain fell within 24 hours. On August 8th at 1.00 pm the water at Banqiao Dam crested and it failed. The wave of the flood was 10 km wide, 3-7 m high with a speed of 50km/hr. Due to poor weather conditions sufficient evacuation warning was not fully delivered. More than 230000 people were carried away. The same storm caused failure of 62 other dams. Some were destroyed on purpose to release water in desired directions. 11 million were displaced. Many reservoirs and dams built during the period 1950 -70 were considered structurally unsafe with engineering and construction errors. In June 1993 the dam was rebuilt and certified. The Great Flood of 1889 occurred due to the failure of the South Fork Dam on Little Connemaugh River, 14 miles from Johnstown Pennsylvania. There was heavy rainfall for several days before the dam broke. The dam had been compromised when small changes had been made to it to convert its reservoir and surrounding areas into a luxury lakeside resort The South Fork Club. Small leaks were repaired using straw and clay. When it breached on May 31st 1889 at 2.50pm, the force of the small river was equal to the average flow rate of the great Mississippi River. It hit the towns of South Fork, Mineral Point, East Connemaugh, and lastly Johnstown. The water was travelling at 40 miles per hour; its maximum height was 60feet at places. Witnesses described the water as a huge hill rolling over as it was carrying a huge amount of debris which included trees, houses, animals, railroad cars and miles of barbed wire. The barbed wire was from the Gautier wire works which was struck on the way. The Stone Bridge was a large arched structure that carried a railway line across the Connemaugh River. The debris in the flood waters formed a temporary dam at this bridge, blocking its further flow. The flood waves surged backwards and forwards in different directions. The debris at the bridge caught fire and burned for three days. The dam took about 65 minutes to empty. 2209 people died. Debris covering 30 acres and reaching 70 feet in height took three months to remove. This was the first worst flood to hit the US. Johnstown is still prone to flooding. More recently the 90 year old Guajataca Dam in Puerto Rico suffered damage during Hurricane Maria in September 2017. More than 70000 residents were evacuated when a crack appeared in the wall. Deposits of ice and snow on volcanic peaks melt rapidly during eruptions. This forms lahar, thick slurry of volcanic ash rushing down the mountainside. Lahars go on for years after an eruption when heavy rains wash off the ash deposited by the volcano. After 69 years of dormancy the Volcano Nevado del Ruiz in central Columbia erupted on November 13th 1985 at 9.09pm. The melting mountain glaciers combined with the ash came down at 60km/hour picking up speed. At 11.30 pm Armero a town at the base of the mountain was engulfed. 20000 inhabitants were killed. Another town Chinchina also was affected with 3000 fatalities. Though warning of potential volcanic activity was given at least 2 months prior by seismologists, it was not taken seriously. The timing of the eruption also coincided with a storm whose heavy rain and thunder camouflaged the sound of the volcano. When the ice built up on rivers during the winters break down, these ice boulders can dam up a river. The area upstream to the ice dam gets flooded. When the ice dam breaks up , a flash flood occurs downstream of its position. The Flood of April 1952 of Missouri river at Omaha is the best example of this kind of flood. Snow accumulation up to two feet melted rapidly in sudden warm weather. This emptied all at once into the Missouri River. On April 16 the river discharged more than 17 million gallons per minute with record stage 40.2 feet. First flood warnings were issued on April 7th from Niobrara to Rulo. Evacuations were done from Dakota city, Council Bluffs, carter lake, east Omaha, Rulo and many other places. 180000 agricultural acres were flooded, 1400 houses too. 13000 people were displaced. Damages were estimated at $11.9 million for the entire flood. Other causes for floods are natural phenomena such as tsunamis and hurricanes. These are relatively less frequent than those caused by excessive rainfall. As time moves on, more floods are predicted at different places due to global warming and climate change which is already evident. 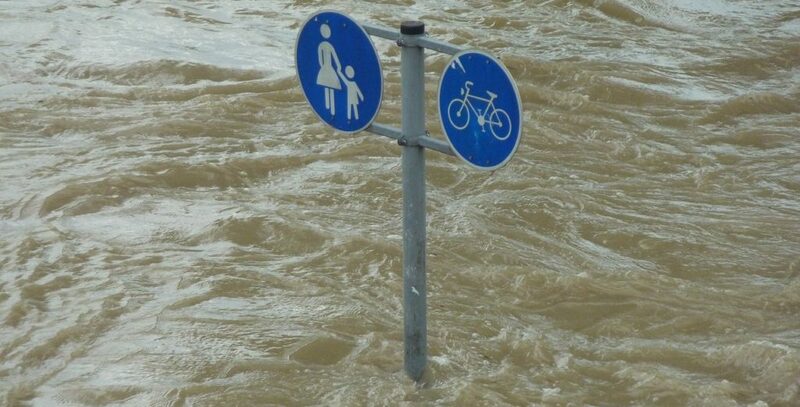 Several flood control measures are taken by governments as awareness increases. But there must be some restriction in blocking natural water flow by dams in the name of power generation or river linking. These are according to the data available till 2017.